Anything can happen in Kitchen Stadium, and these photos prove it. 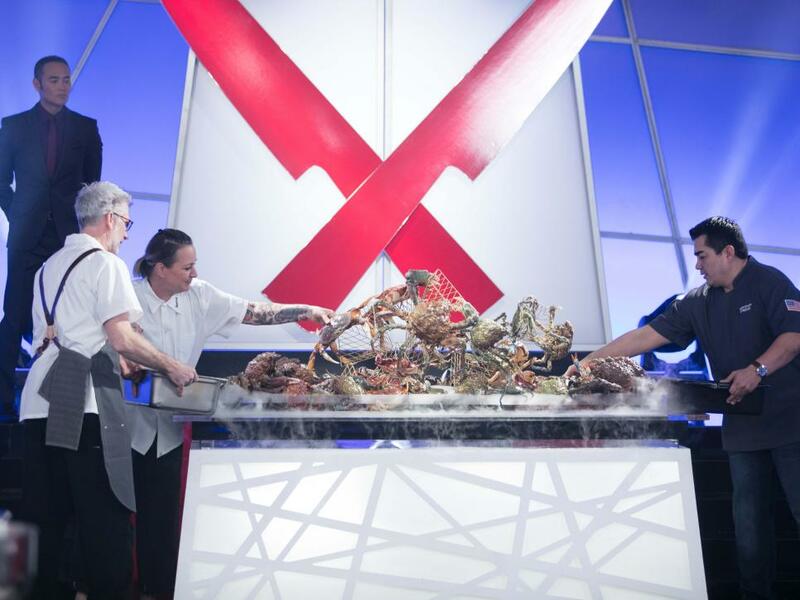 The Chairman forced Iron Chef Jose Garces and his challenger, Chef Carolynn Spence, to get a little crabby for tonight’s battle when he revealed an altar full of gorgeous crab. 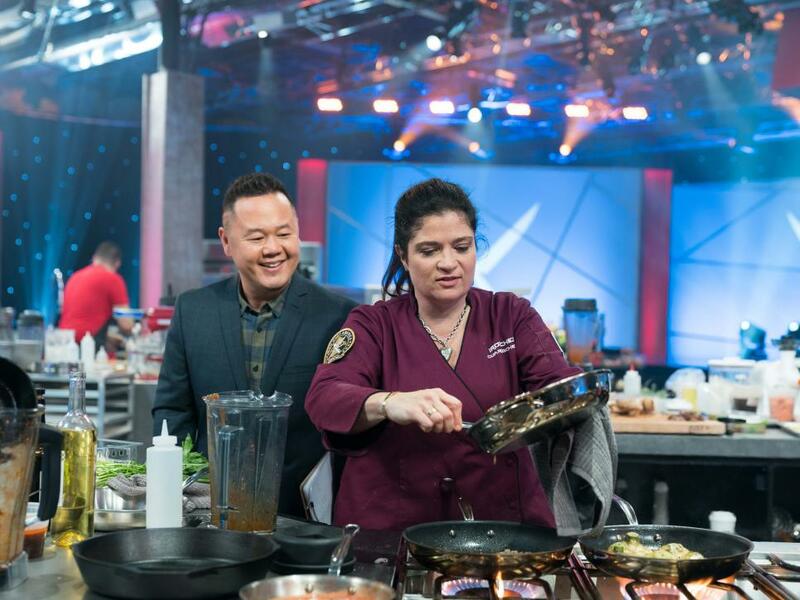 The Iron Chef’s plan was clear: shine a bright light on the freshness of the seafood through a myriad of international flavors. Jet visited Alton’s station with a special pal in tow: a tiny crab that challenger Chef Spence would ultimately turn into a cake and ice cream later. 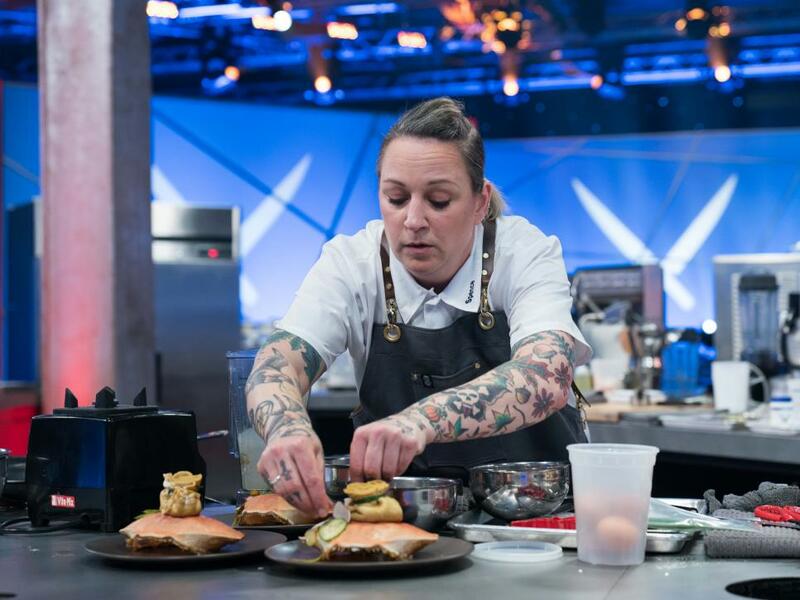 Though Chef Spence utilized crab in several ways in her first offering, including a crepe batter that was made with “crab guts,” as judge Lesley Bargar Suter said, the Iron Chef ultimately earned two more points that she did with his Spanish-inspired plate. The early-round struggle didn’t get her down, though. “We’re going to knock it out,” she declared. Crab is a decidedly savory ingredient, but both chefs opted to prep dessert for their fifth and final offerings. 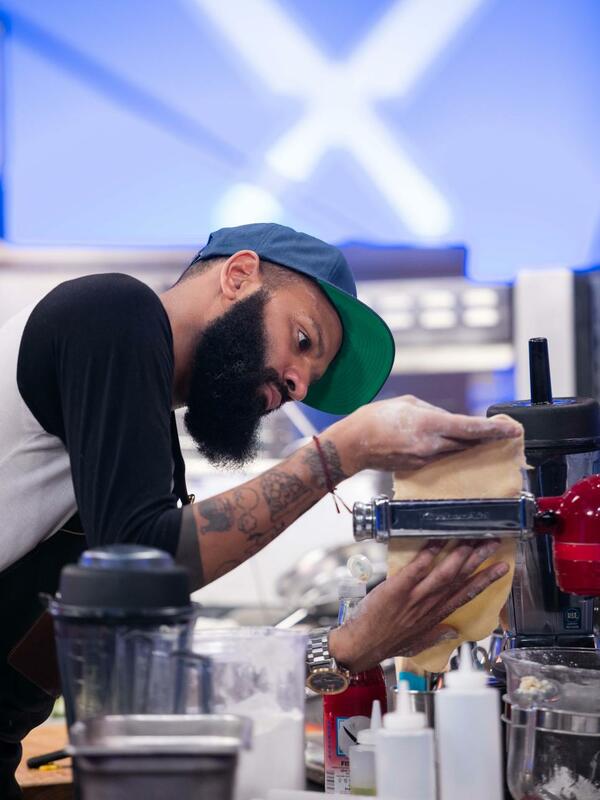 While the Iron Chef presented his take on a crab ice cream, Chef Spence made a crab cake — literally. It was indeed a cake in the shape of a crab. 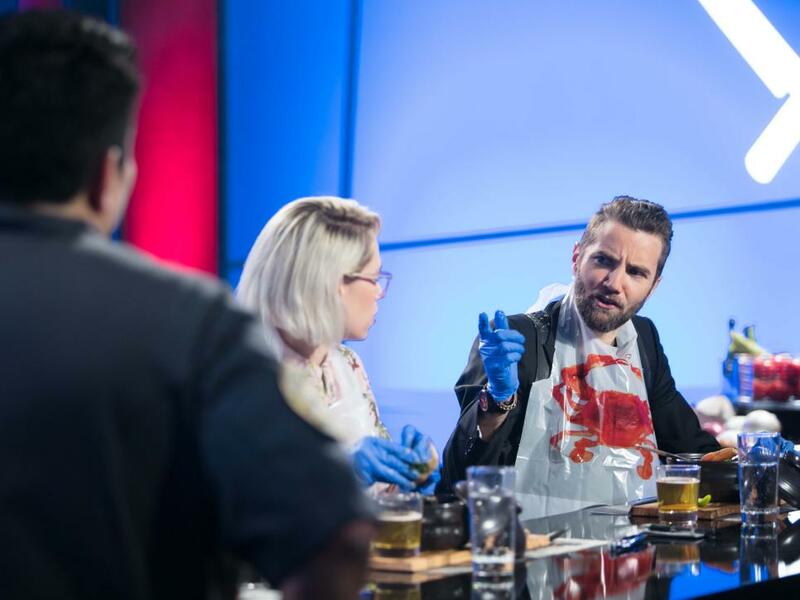 Outfitted with gloves and bibs, the Chairman and the judges approached the Iron Chef’s joint Singaporean-Japanese presentation of chili crabs and okonomiyaki. 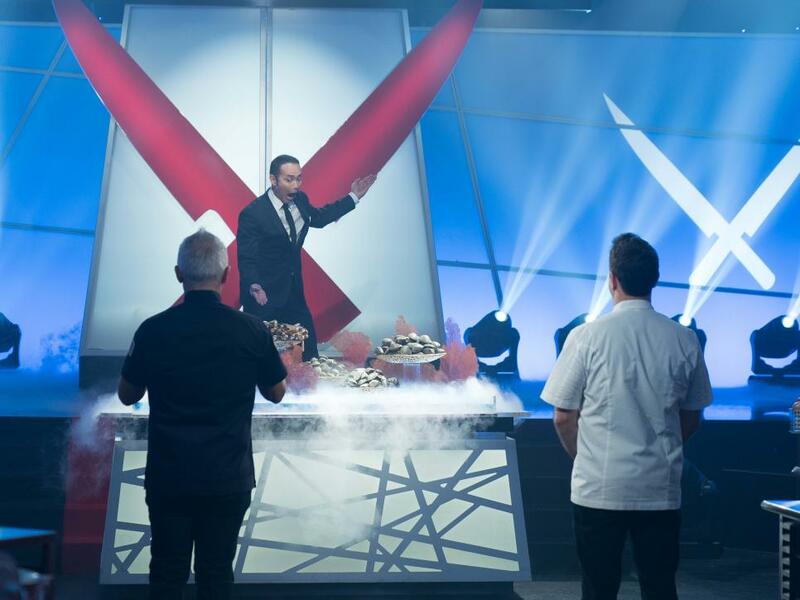 As has happened in many competitions past, the Iron Chef fell victim to the curse of the double-dish. 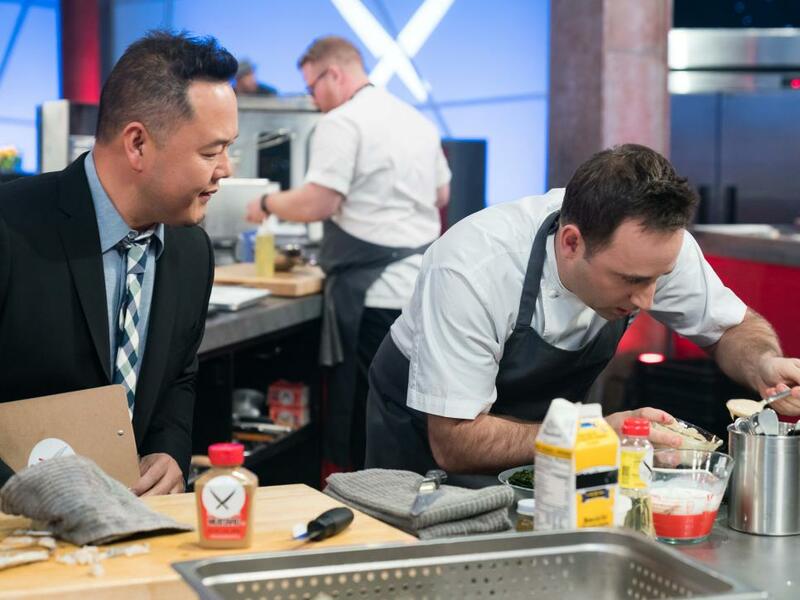 He offered two things, which meant that the judges were left rivaling them against each other; while they were big fans of the chili crab, the okonomiyaki (a savory pancake) wasn’t as impressive comparatively. 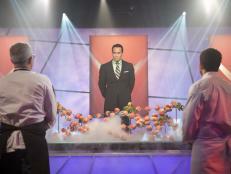 Following his success in the first round, the Iron Chef continued his strong showing until the very end. 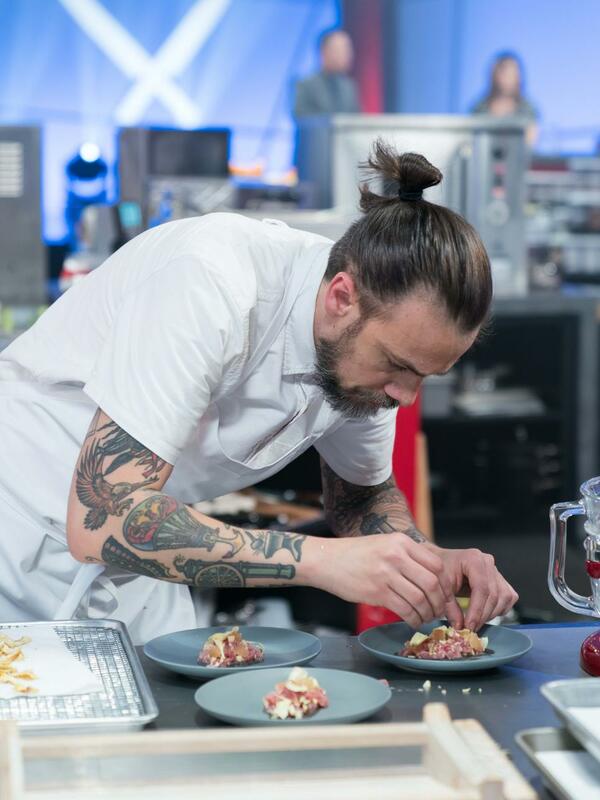 He ultimately out-performed Chef Spence by a whopping 10 points, beating her in every category. 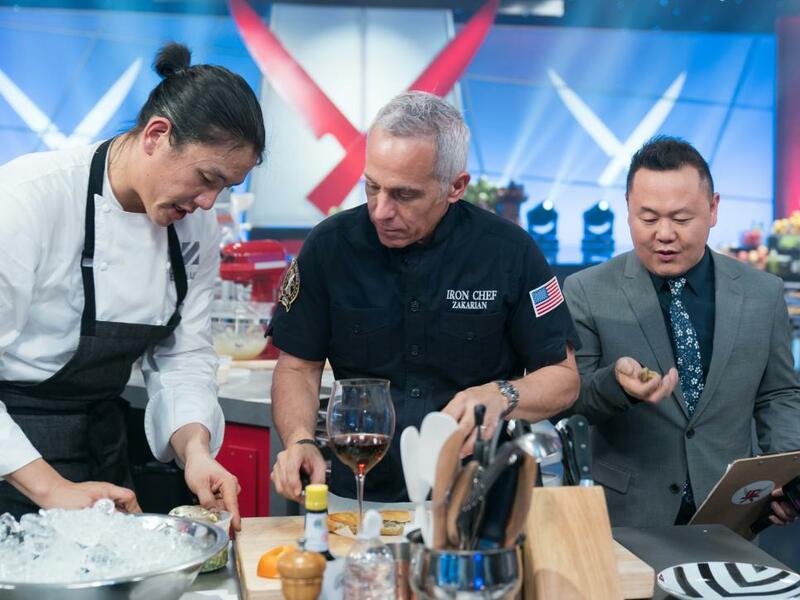 The Chairman offered up a bounty of fresh clams on the altar for tonight’s seafood showdown, in which Iron Chef Geoffrey Zakarian and challenger Chef Lee Wolen were set to go head to head. 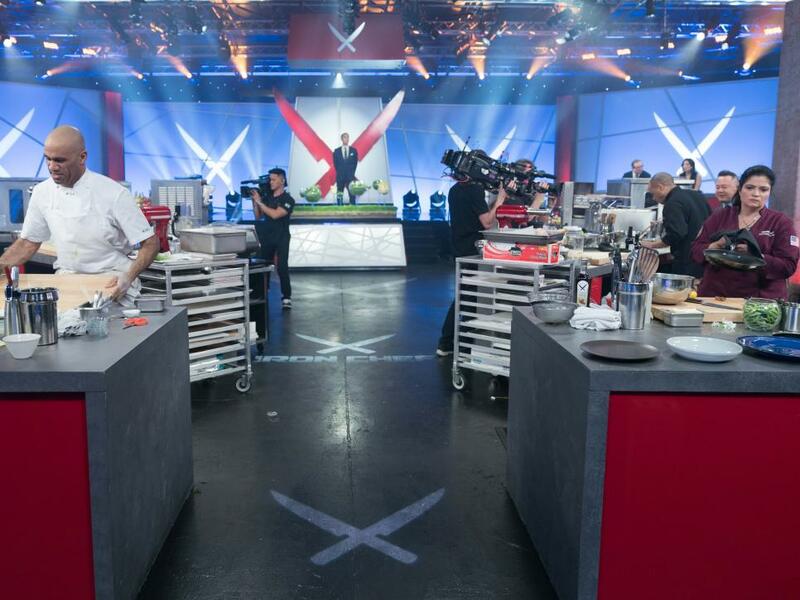 Though both chefs opted to create similar dishes, the styles in which they prepped them and the ingredients they used to complement the dishes varied greatly, guaranteeing a diverse menu for the judges. It turns out that every. last. point. matters in Kitchen Stadium. 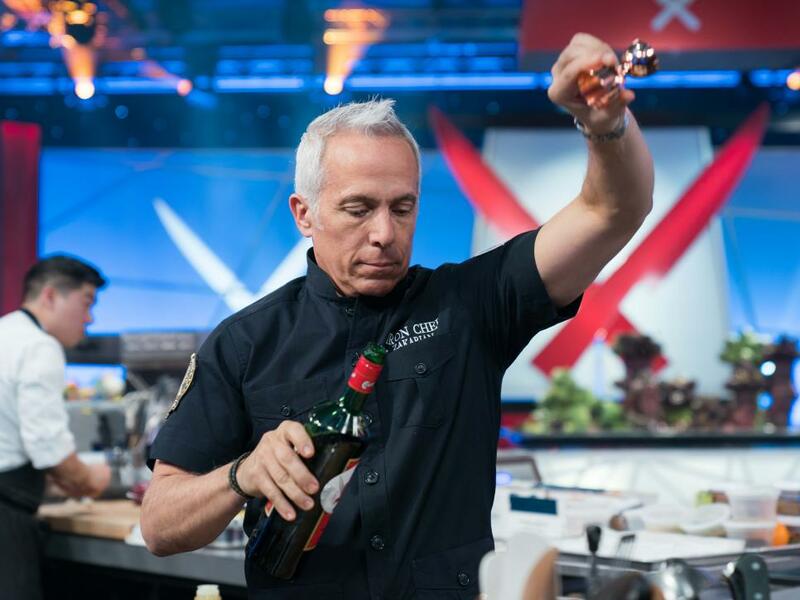 Chef Wolen clinched a win with the smallest of margins over Iron Chef Zakarian — just one point — with his 20-minute dish. He opted for a duo of clam preparations (one fried, one raw), while GZ offered a play on pasta with clams. The challenger was excited to have the lead and used the momentum to carry him forward. Ever wonder how Alton is able to see all the action from his perch at the back of Kitchen Stadium? 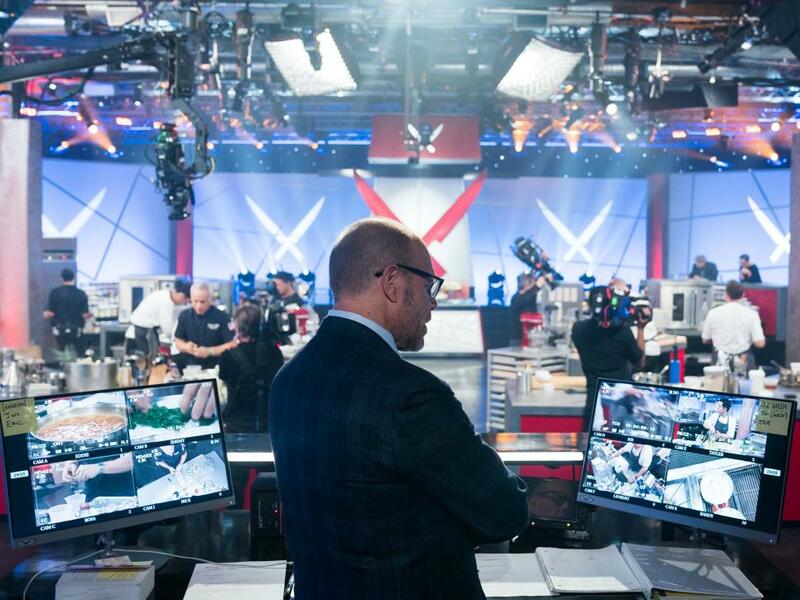 He has access to all the cameras covering the competition, which means that he sees exactly what the director and producers of the show see as well. Simply put, he has the best spot in the house. 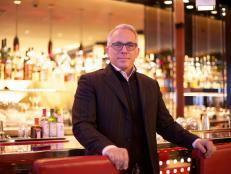 The Iron Chef brought an element of refined simplicity to his clam menu. He purposely stayed away from doctoring up the seafood with big, bold flavors that threaten to mask the clams; instead, he offered subtle but noticeable taste through ingredients that complemented the clams. And the judges surely appreciated his efforts. 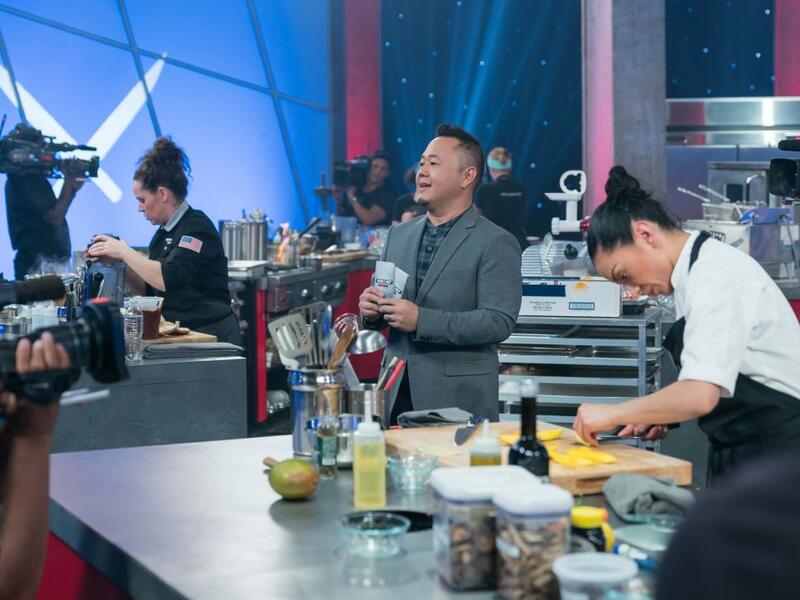 No matter Chef Wolen’s early-round lead, the Iron Chef came back to claim the win in Battle Clam after out-scoring his opponent in each of the three remaining categories, ultimately totaling a three-point victory. 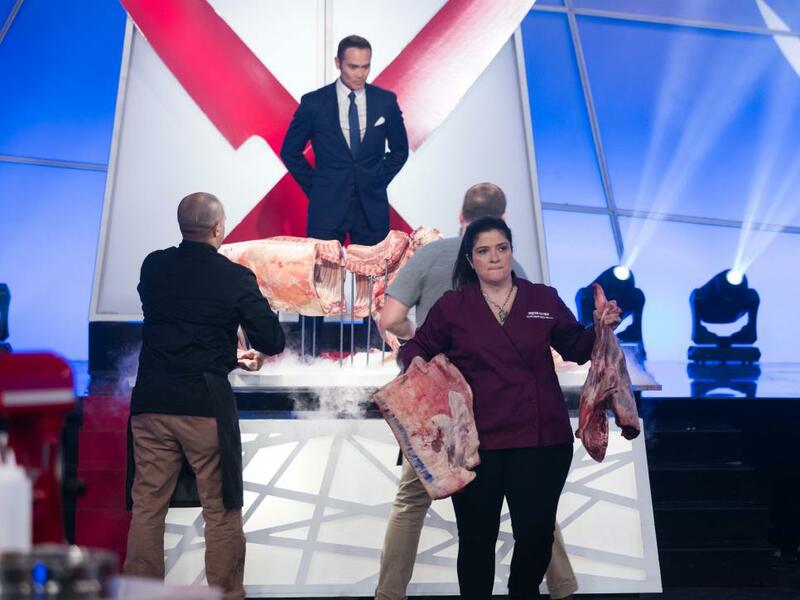 The Chairman unleashed a meaty task onto Iron Chef Alex Guarnaschelli and her challenger, Chef Justin Sutherland. 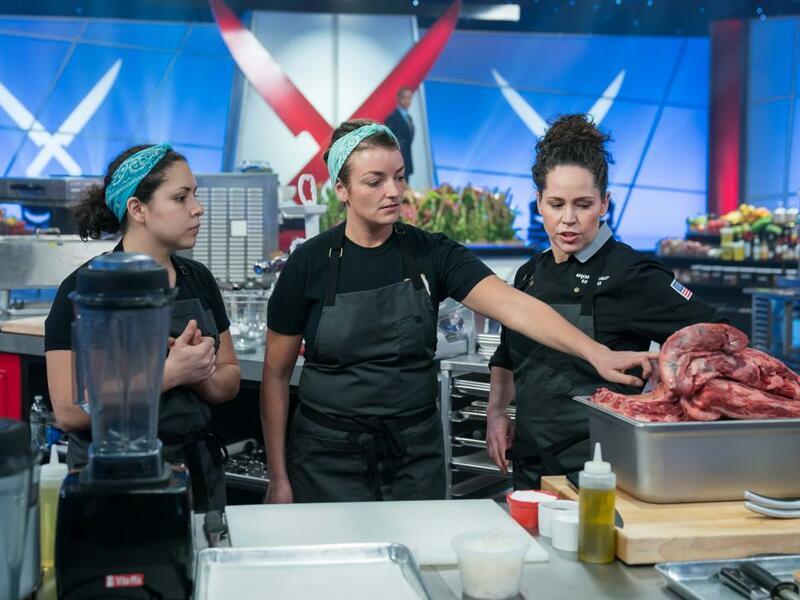 They each grabbed racks, ribs and loins from the altar, and quickly started executing their 20-minute dishes with their team. In a celebration of the classic pairing of lamb and mint, Alex served the judges a mint julep alongside her lamb skewers. And, of course, Alton got a taste too, much to his delight. 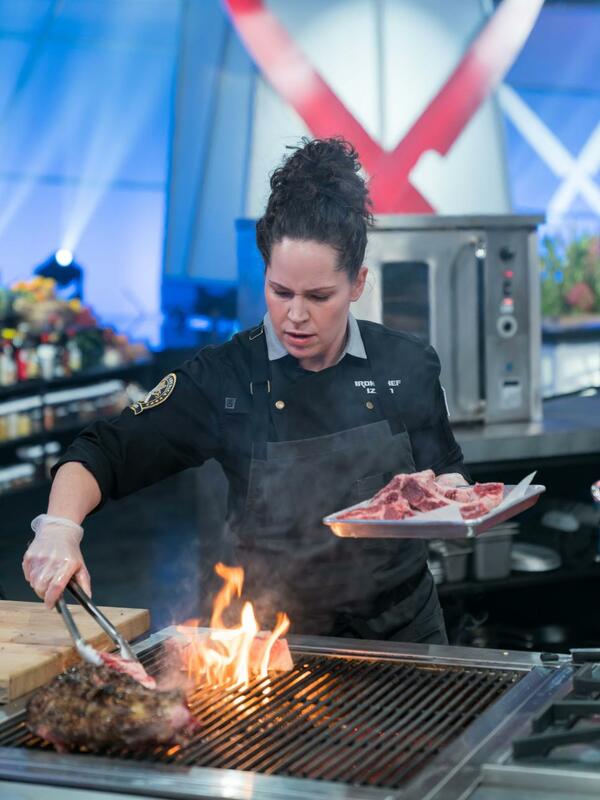 Alex and her team made sure to demonstrate not only different preparations of lamb but also different cuts of the meat too. The judges appreciate that showing of versatility. 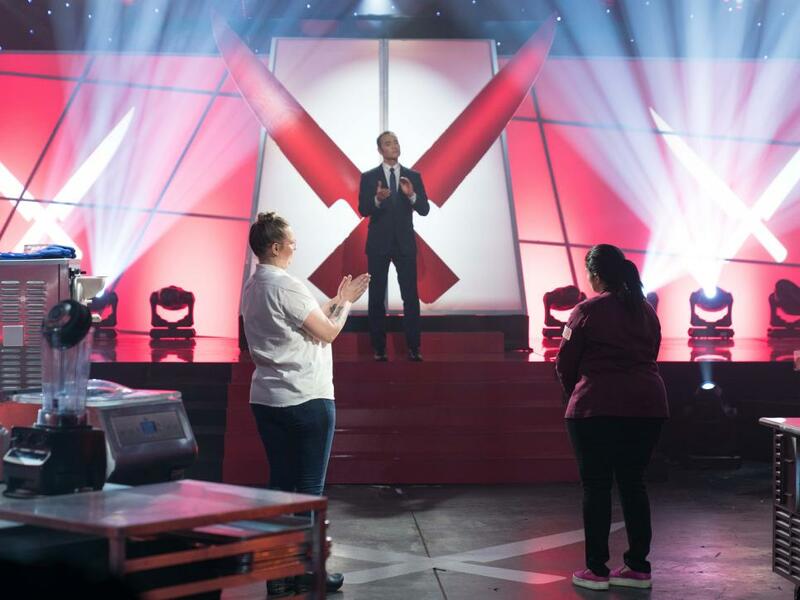 It’s not often — ever, actually — that the judges leave their table, but tonight, Jonathan Waxman and Susan Feniger got in on the action when they visited the Iron Chef and challenger during the battle. However, they were quickly ushered away so as not to allow the chefs to focus. 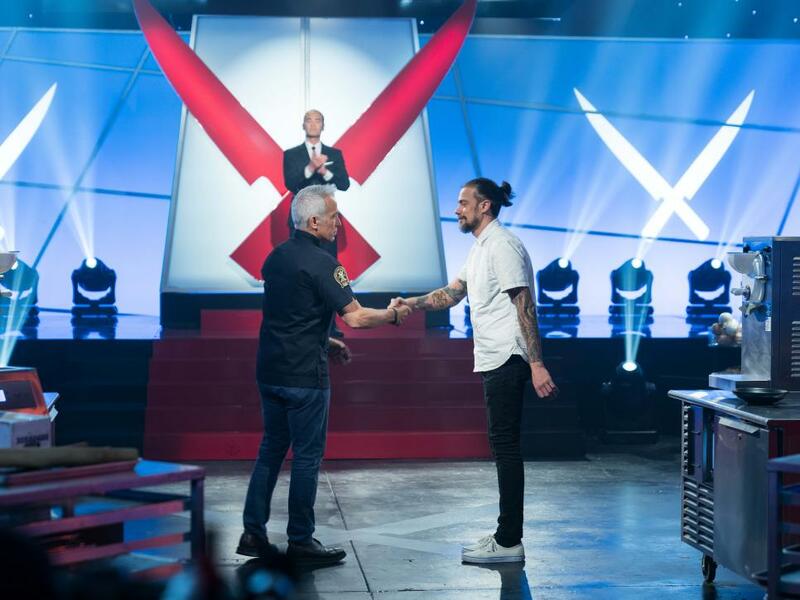 Following the two-point deficit that occurred after presenting his first dish, Chef Sutherland was more sure than ever that he and his team could execute the rest of the menu and ultimately claim the win in this battle. He put his head down and worked — particularly hard on the noodle dough for his ramen, in fact. One of our favorite parts of battle is when Alton drops his signature knowledge from his perch. He was full of lamb facts today. 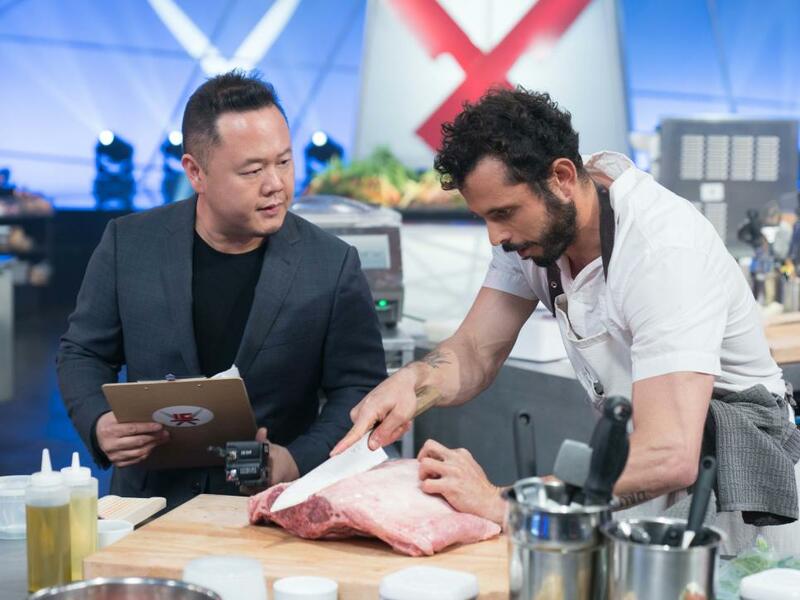 Though he was two points behind the Iron Chef following the first dish, he quickly made up the points with the rest of his menu. 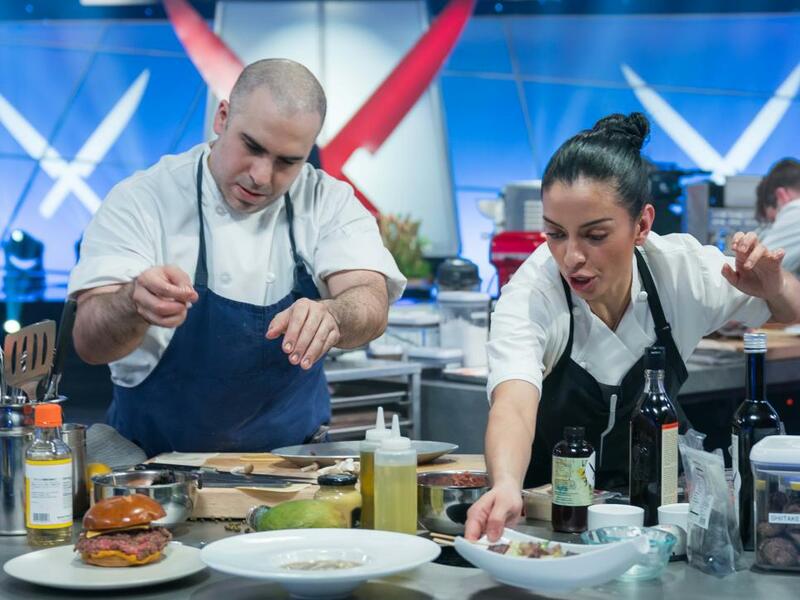 Ultimately, he beat Iron Chef Guarnaschelli by a whopping four points, out-scoring her in every remaining category. 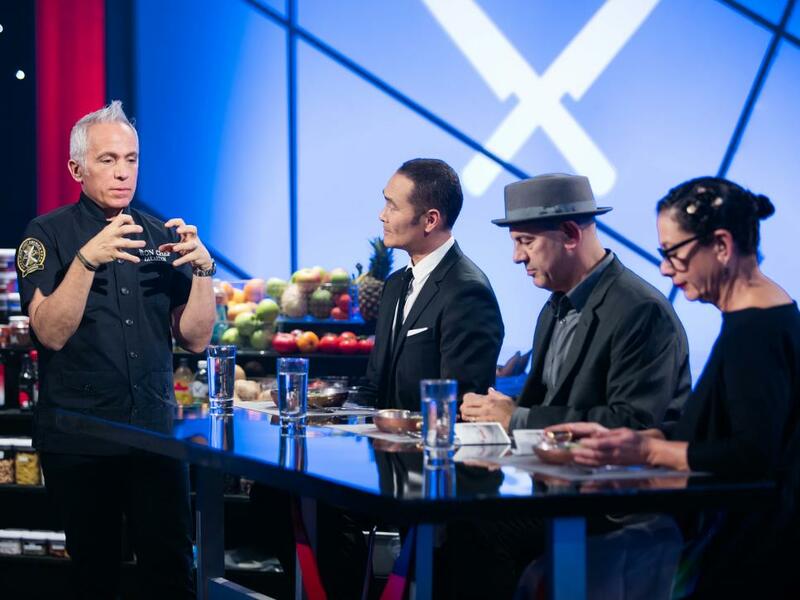 The Chairman unveiled a bounty of fresh artichokes for today’s battle, and like true worthy opponents, both Iron Chef Zakarian and Chef Darin got to work executing a menu of dishes that showed off the vegetable in its myriad forms with varied techniques. 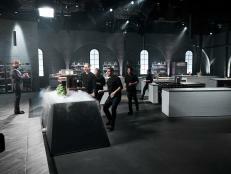 One point separated the competitors after their first-course offerings, though neither of them paid much attention to the results. 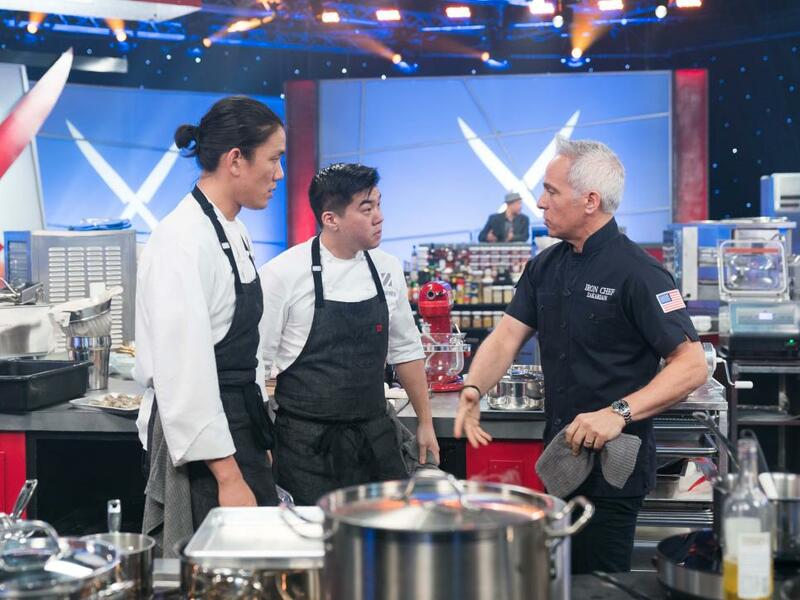 While the Iron Chef couldn’t allow his team to get comfortable with their lead, the challenger didn’t let his (slight) early loss slow him down with so much left to do. 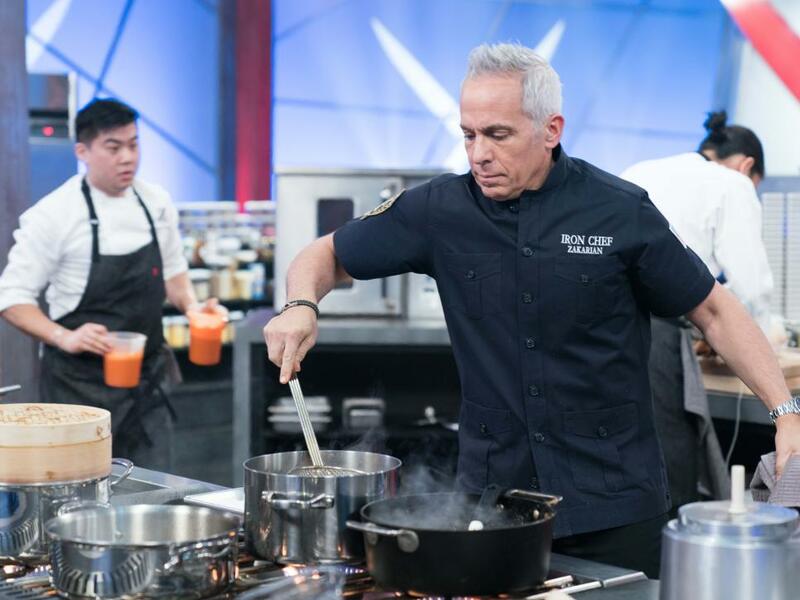 Leave it to Kitchen Stadium’s unofficial mixologist Iron Chef Zakarian to shake and stir up multiple drinks during the battle. Not only did he mix up two cocktails, but he also made coffee infused with cardoons to pair with the baklava dessert. 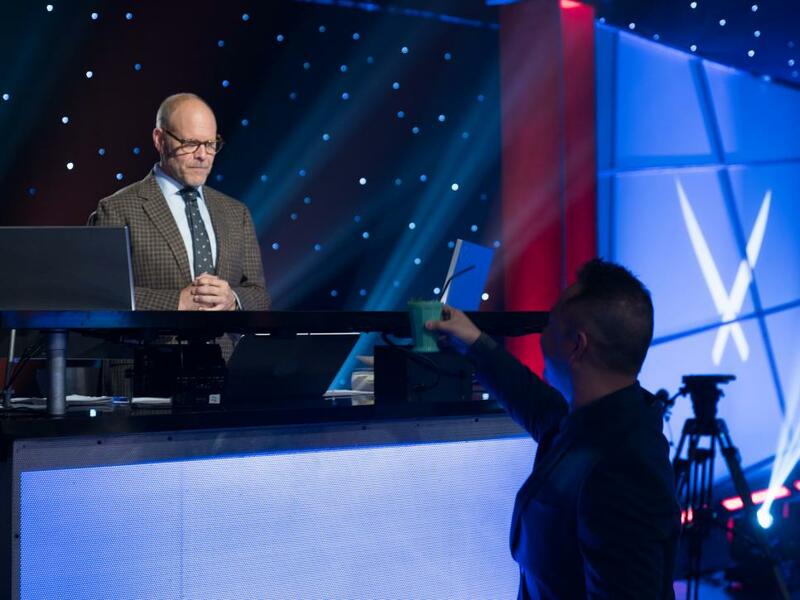 And lucky for Alton and Jet, GZ was more than willing to share his sips with them, even before presenting his offerings to the judges. Thanks to the help of his sous chefs, Geoffrey executed the first-ever timpano in Kitchen Stadium. This dough-wrapped pasta-filled showstopper was layered with tomato sauce, hard-boiled eggs and spicy Italian sausage, and they did it in record time. 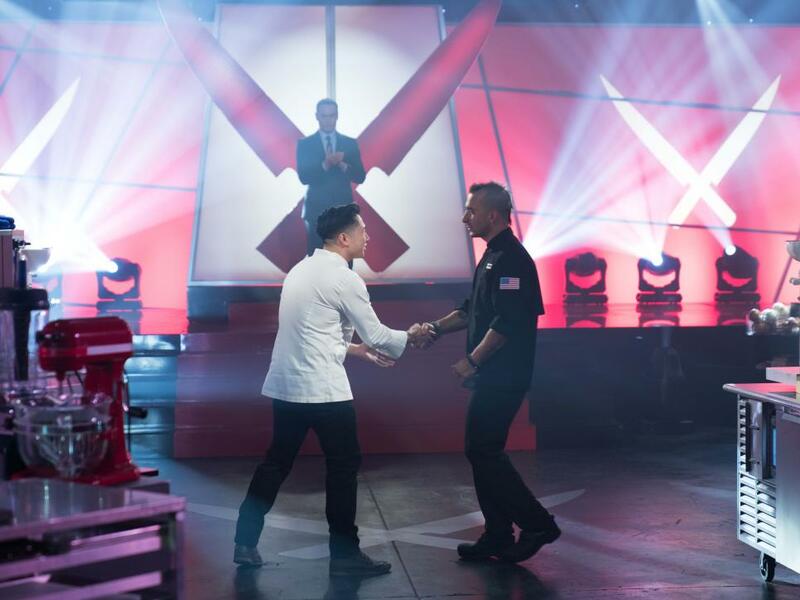 Though they tied in both the plating and originality categories, the Iron Chef out-cooked his competitor in the taste category, thus solidifying his win. 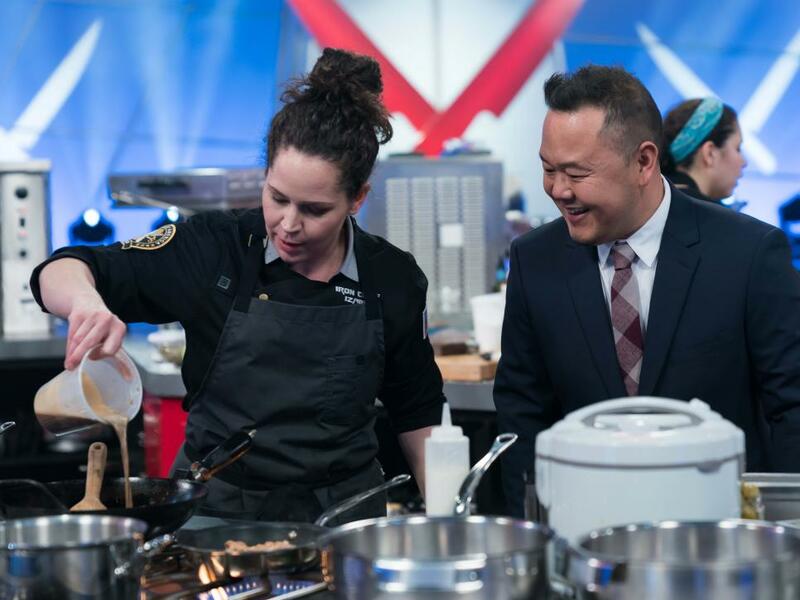 Though the pressure under which Iron Chef Stephanie Izard and challenger Chef Erik Battes were forced to work was indeed great, this week’s Secret Ingredient is downright tiny. Olives were the name of the game, and the Chairman had rounded up seemingly each and every variety available. This ingredient is particularly tricky, the Iron Chef explained, because olives are packed with salt, and making the focus of a dish takes a lot of finesse. 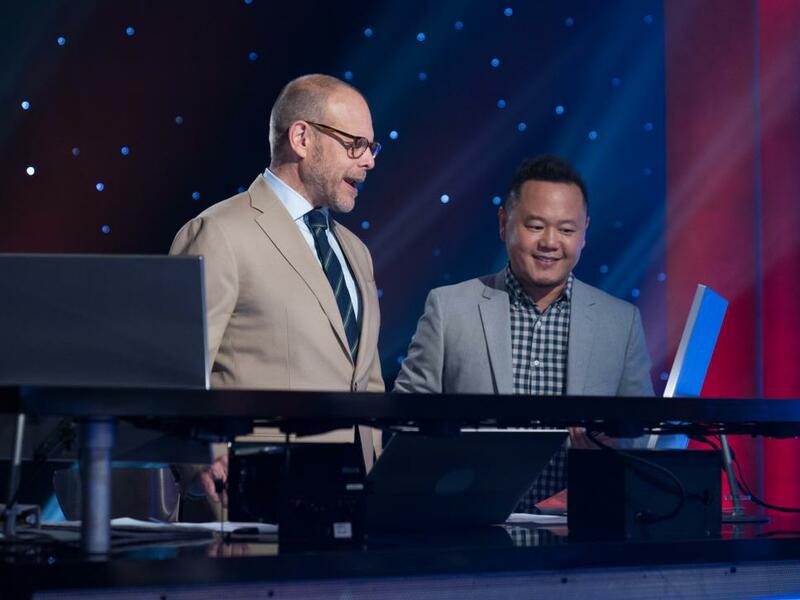 Not only are Alton and Jet colleagues on Iron Chef America, but they’re also pals in real life, so much so that they recently went under the knife together to get matching tattoos. 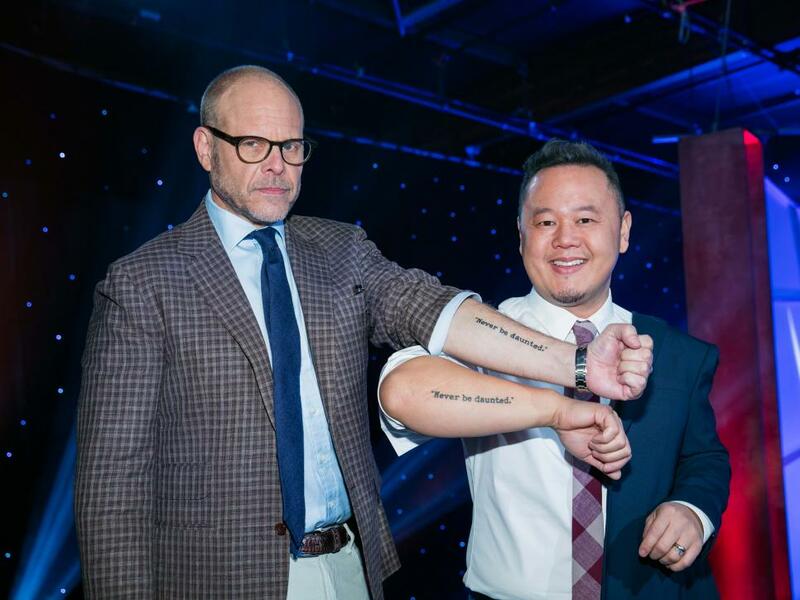 “Never be daunted,” reads the ink on each of their forearms. Chef Battes brought his A-game for the first dish, offering the judges not one but three plates in an exploration of air, land and sea. 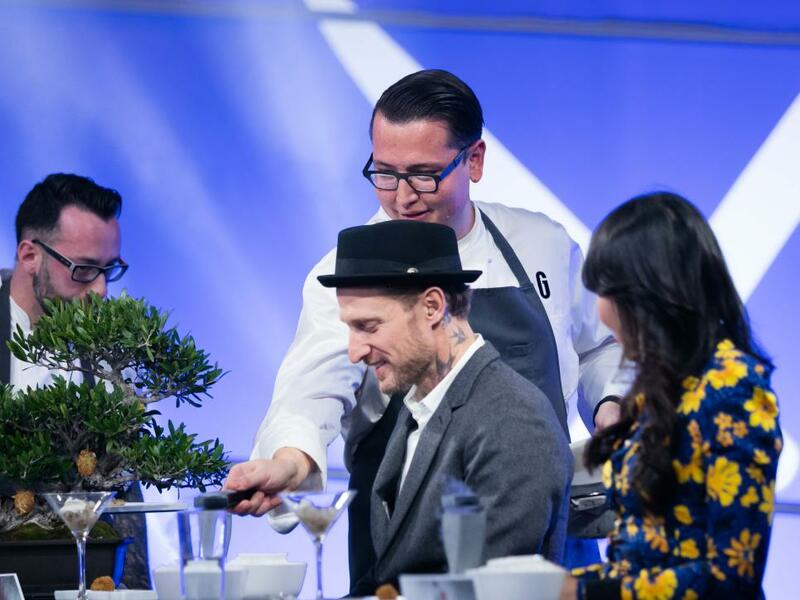 One dish — an embodiment of air — featured a floating element that downright shocked the panel. Another presentation included a miniature Bonsai tree, from which the chef hung his fried stuffed olives. 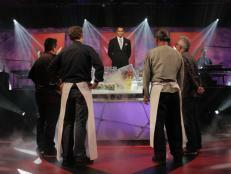 He earned a perfect score, while the Iron Chef earned an impressive 8 points. 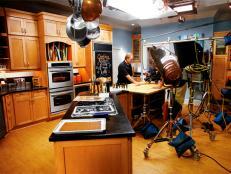 It’s not easy being on set in Kitchen Stadium, as both Alton and Jet know well. But that doesn’t mean they don’t have time to document the experience. First up — a selfie behind the scenes. 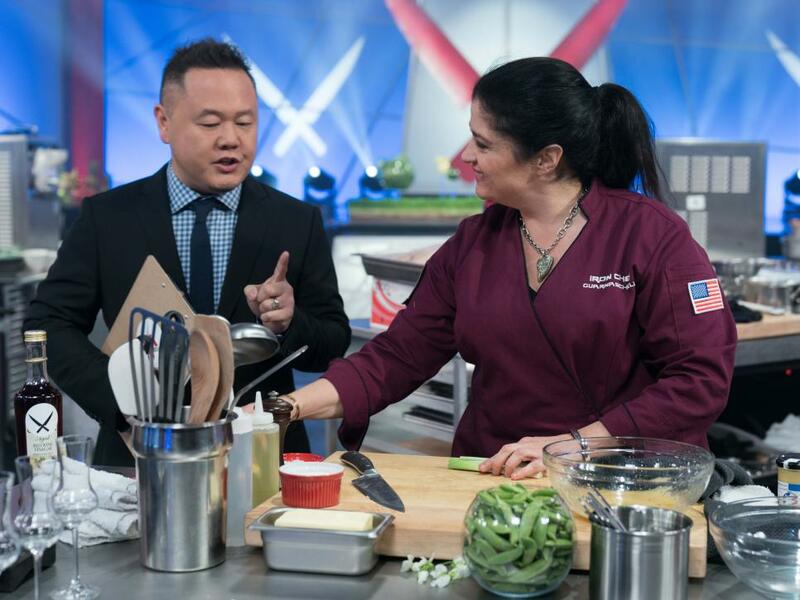 Though the challenger enjoyed a two-point lead over the Iron Chef after the first dish, Iron Chef Izard didn’t back down from her plan. 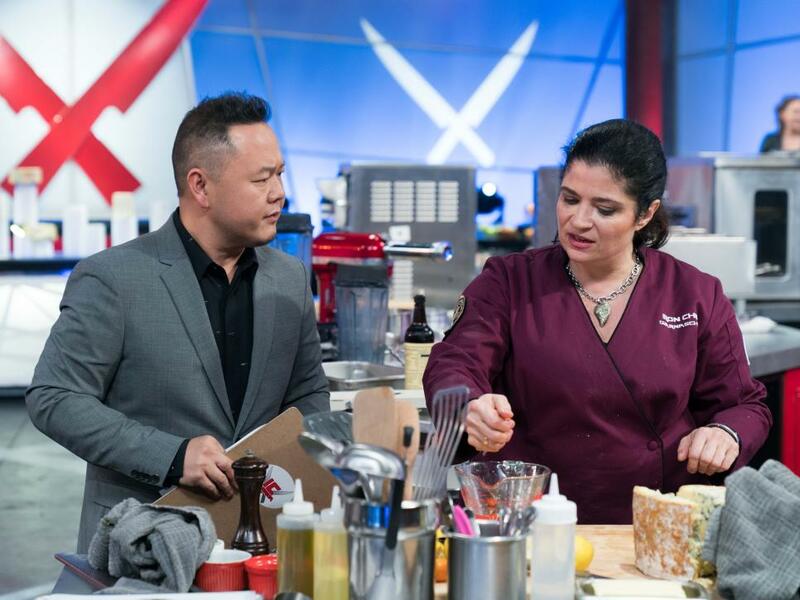 She and her team continued to execute her style of cooking in Asian-style dishes and playful interpretations of classic items. This just goes to show that the battle isn’t over until the Chairman says so. 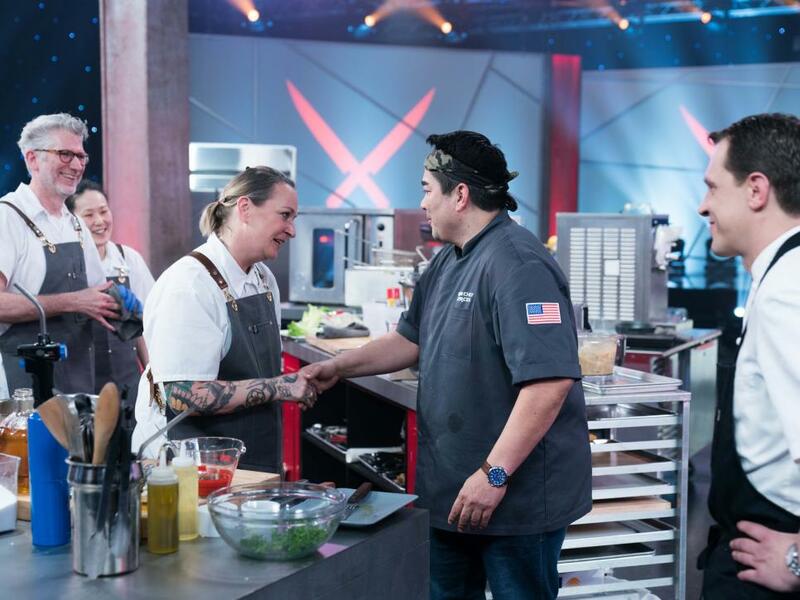 Despite her two-point deficit, the Iron Chef rallied to ultimately out-score her opponent by a single point to earn the win in the end. They tied in the category of plating, but she beat him both taste and originality. 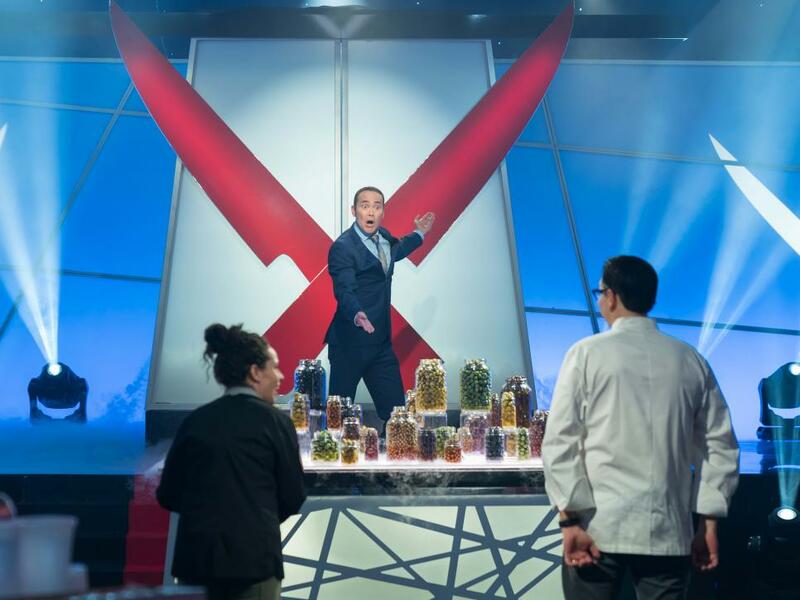 All Iron Chef America battles are tricky, of course, but when the Secret Ingredient so subtle like peas, the task at hand becomes particularly daunting. 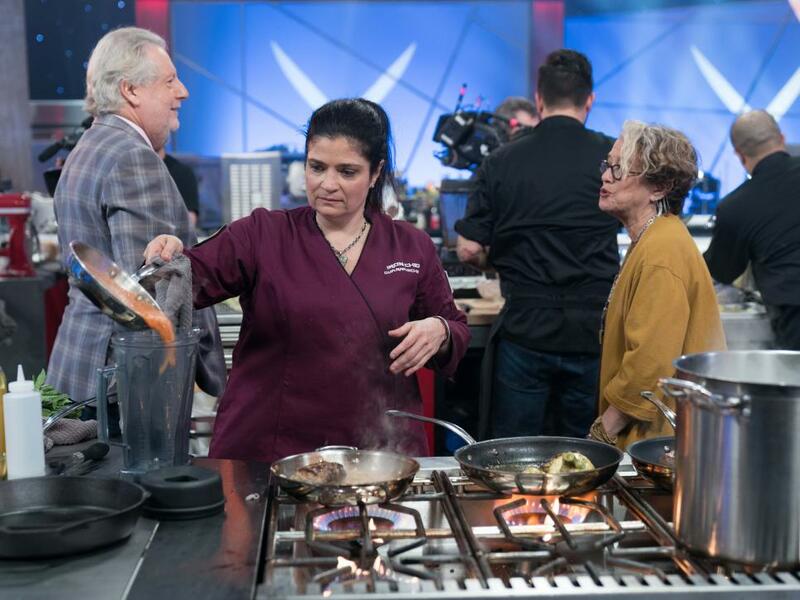 Iron Chef Guarnaschelli, of course, rose to the occasion tonight and set out to both honor the classics and reinvent old-school flavors for which peas are known. 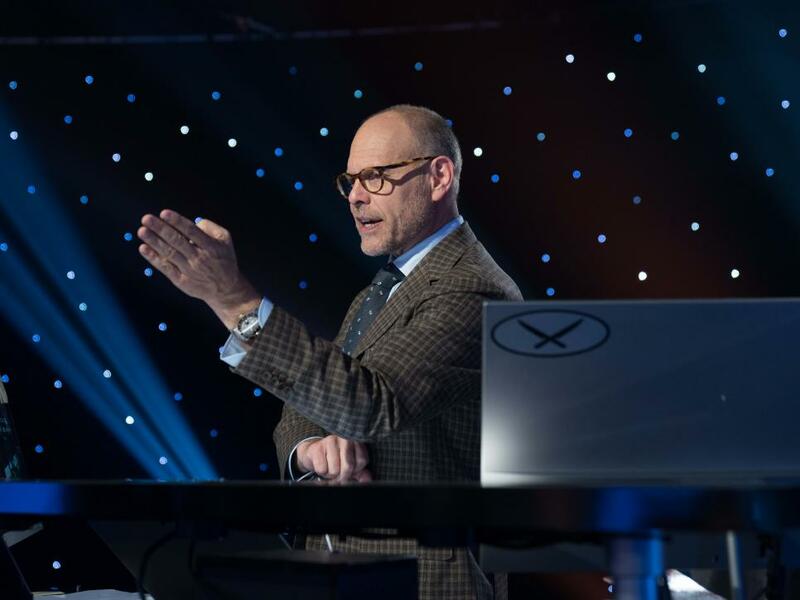 Following judgment of their 20-minute dishes, challenger Chef Williams and the Iron Chef were close in points — only two separate them — with the Iron Chef in the lead. 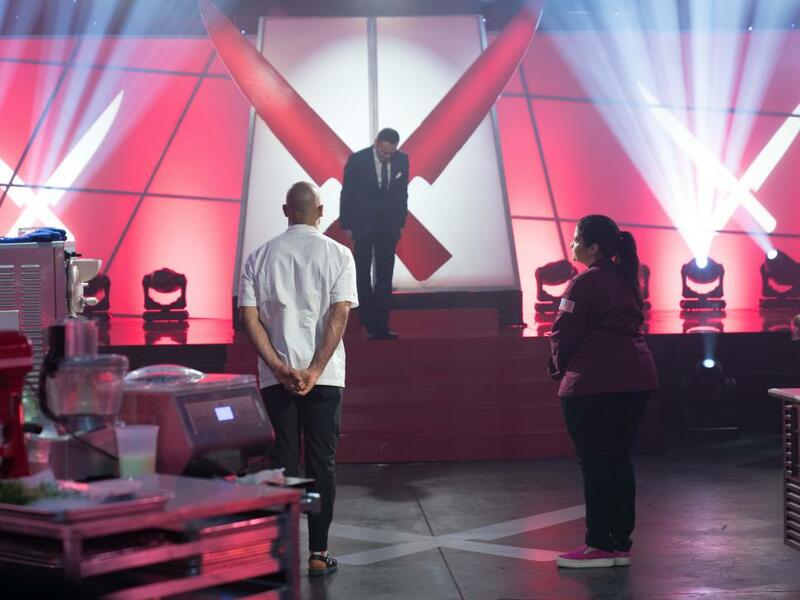 For the Iron Chef, this early lead was nice, but she remained cautious and intent in her execution. Over on Chef Williams’ side of the kitchen, he worked on homemade gnocchi, which were to be served with a fresh pea-butter sauce. You know what they say about great minds. 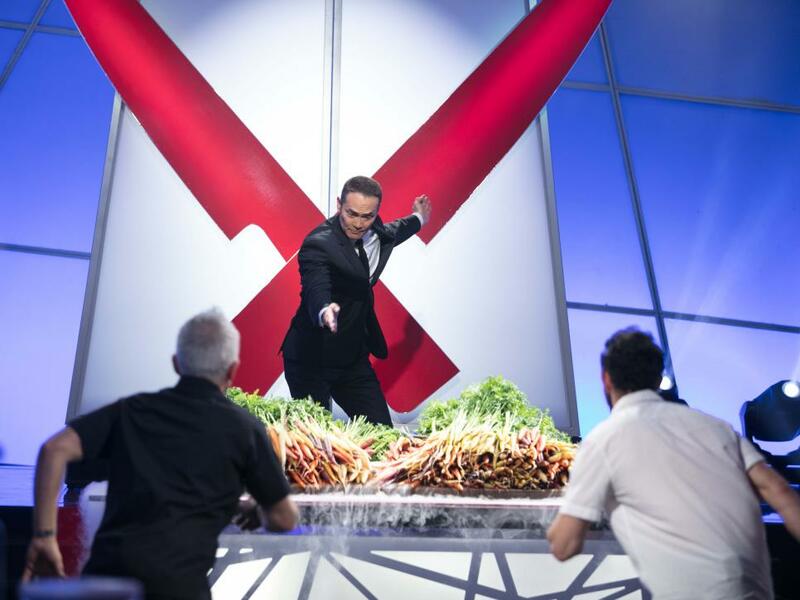 It turns out that the Iron Chef had a similar plan for pasta; one of her sous chefs made sheets of pea pasta and turned them into cheesy ravioli that looked like pea pods. 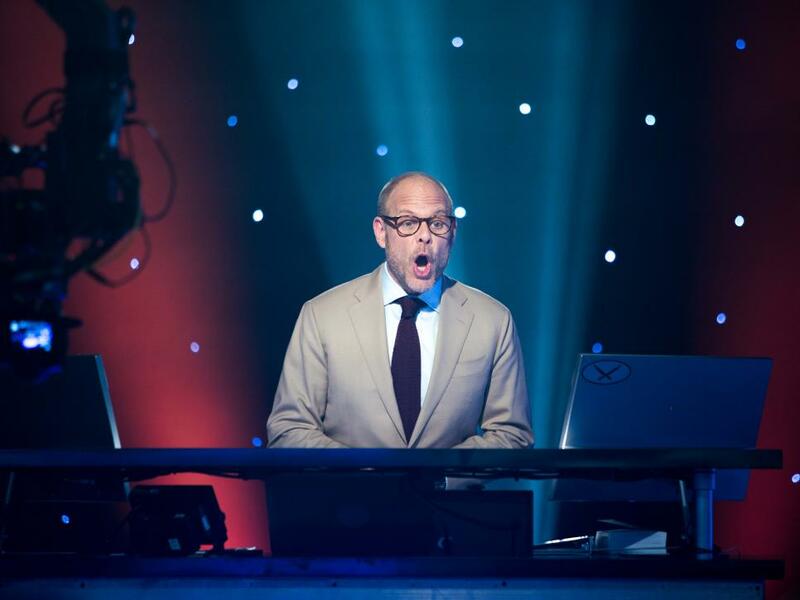 There’s no doubt that the scene at the judges’ table is often fraught with anxiety. 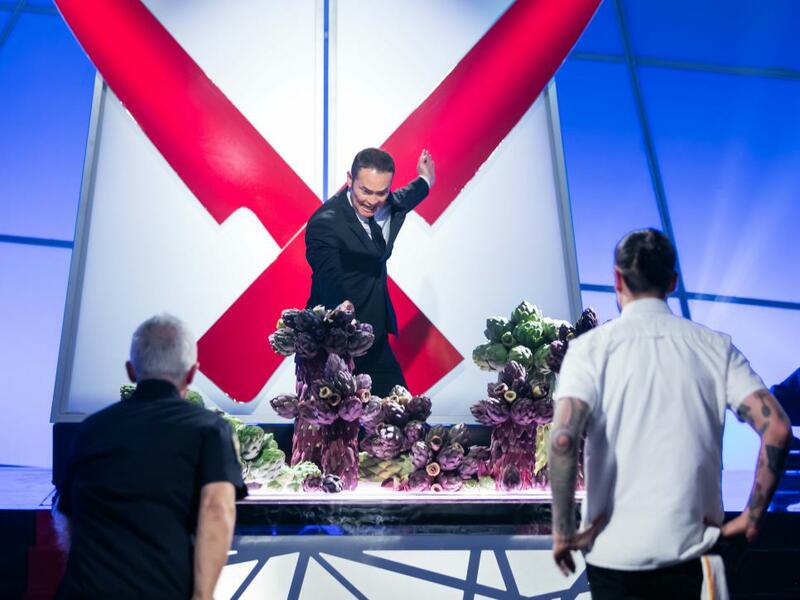 But just because the stakes are high doesn’t mean that the judges — and the chefs — don’t know how to have fun. John T. Edge and Ming-Na Wen were all too ready to start laughing. 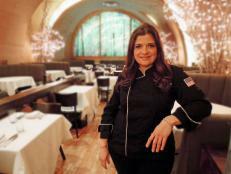 The lead Iron Chef Guarnaschelli earned after her first dish only grew as the battle went on. 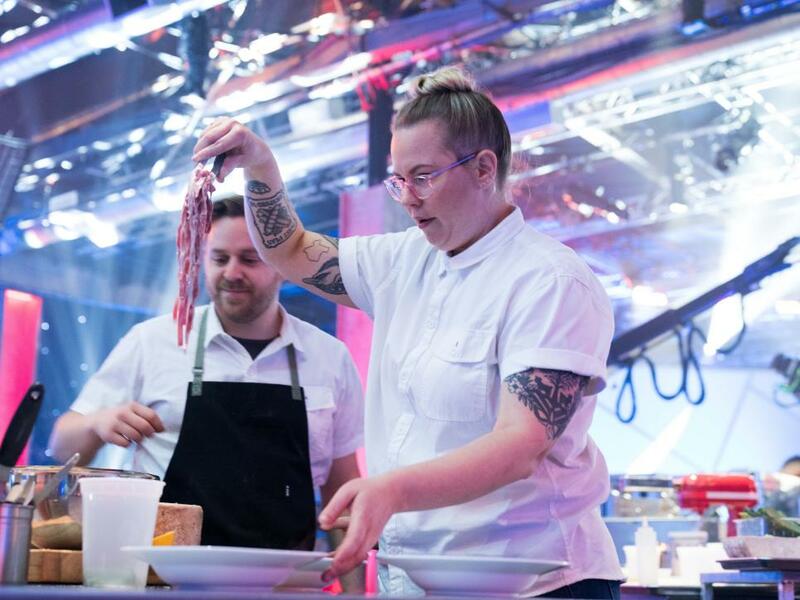 After all the offerings had been tasted, she scored a nine-point victory over Chef Williams. 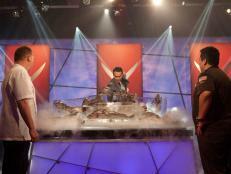 Kitchen Stadium was turned into a seafood house tonight when the Chairman unveiled an altar of swordfish. 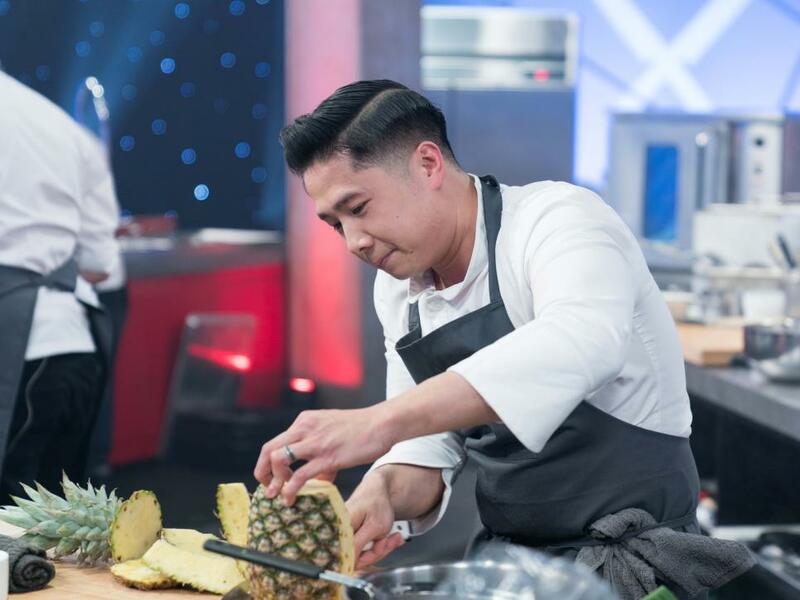 For the first dish, Iron Chef Forgione opted for an exceedingly simply preparation of grilled swordfish, while the challenger, Chef Dang, opted for a crudo-style offering with nuoc cham. The verdict? The Iron Chef out-cooked by just one point in that round. 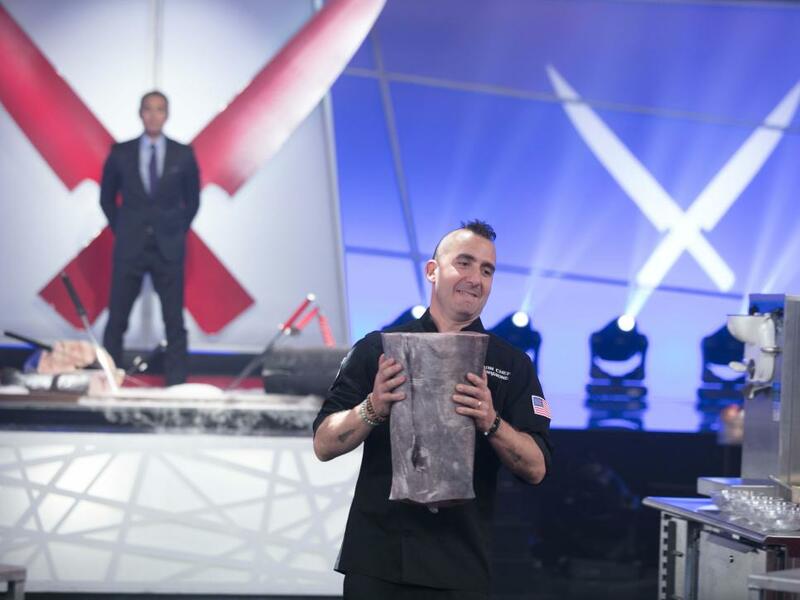 With a margin of just five precious points, Iron Chef Forgione bested his rival today, out-scoring him in each round. 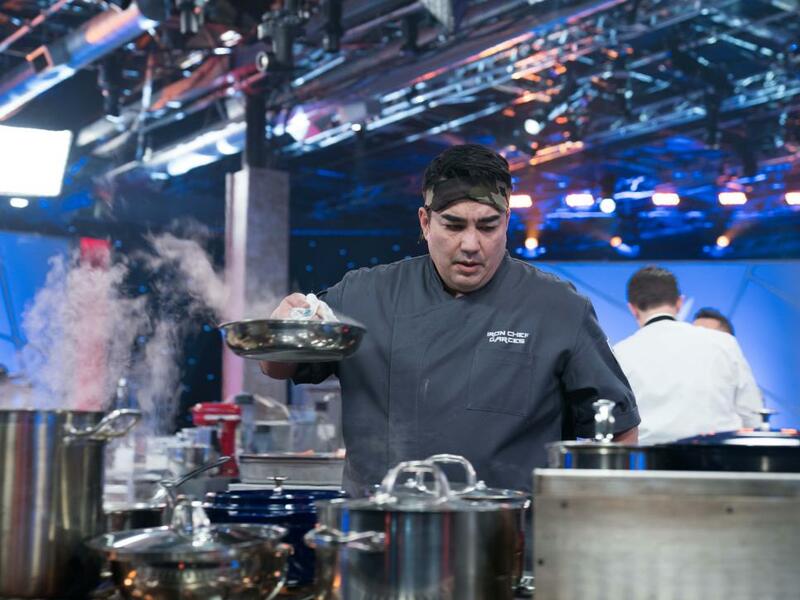 “It feels so amazing to come back here and get this victory,” the Iron Chef said, reflecting on the outcome. Though carrots may be something you chop up in a salad or simply snack on in their “baby” form, they took center stage tonight for a colorful showdown featuring orange, purple, red and yellow carrots with their bright-green tops. 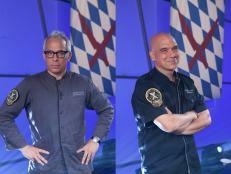 Both chefs opted for a mix of carrot preparations, much to the judges’ delight. Alton can see everything — and we do mean everything — from his perch in Kitchen Stadium, and sometimes, the action is a little overwhelming. Because carrots can straddle the line between savory and sweet, so too did the chefs’ dishes. Here challenger Chef Taymor is prepping lamb for his first-course carpaccio, though later on he went on to serve a sorbet complete with a carrot-infused caramel sauce. 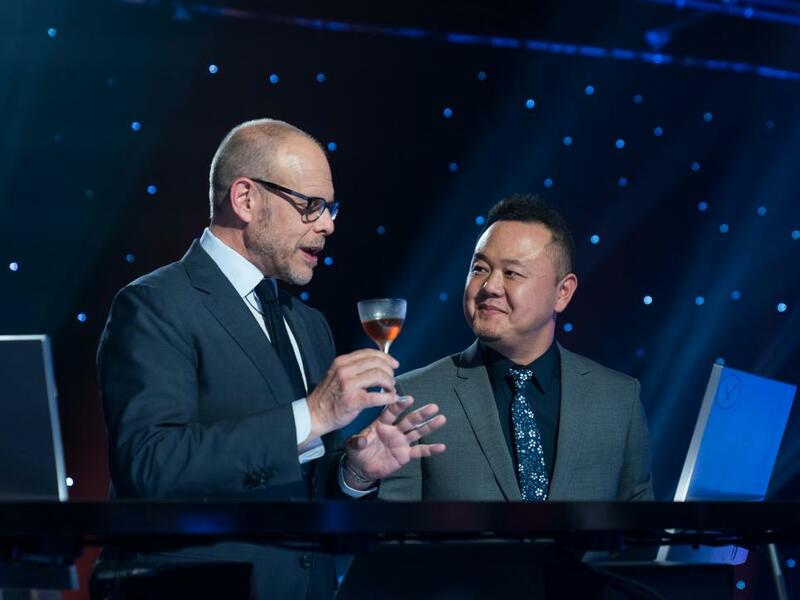 The Iron Chef treated carrots as he would shrimp in a play on a Salt and Pepper offering for his dish, and the judges were into it — especially compared to the lamb carpaccio that challenger Chef Taymor presented. Following that 20-minute judgment, GZ was ahead of his opponent by two points. 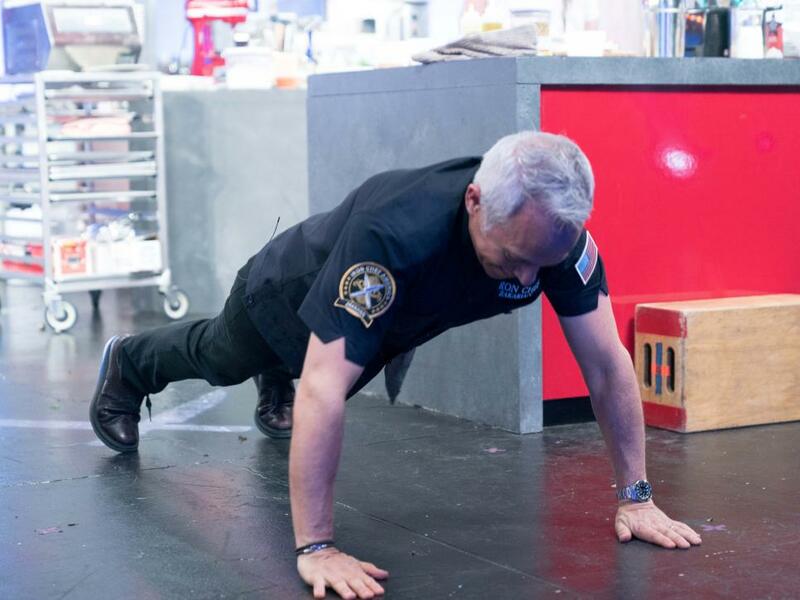 After Alton jokes with the Iron Chef about being an “old man,” GZ dropped to the group for an impromptu set of push-ups. 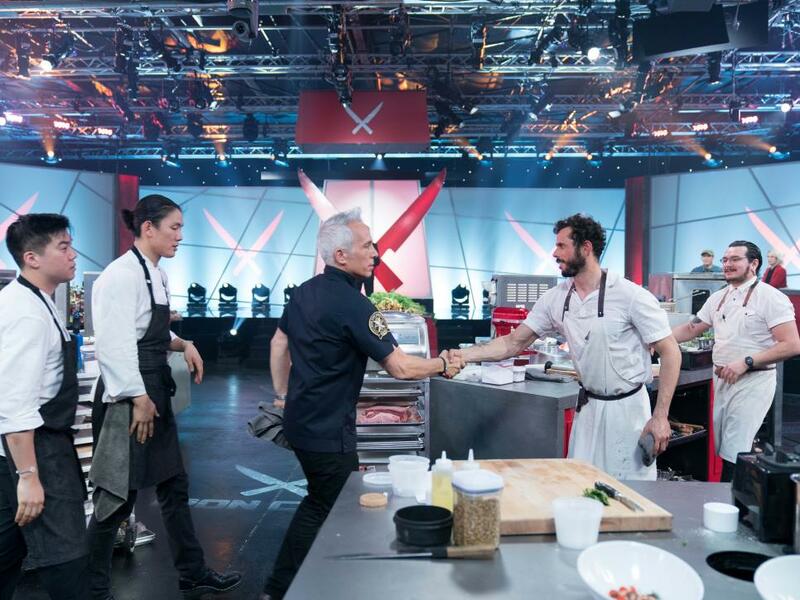 Despite the Iron Chef’s victory in the first round, Chef Taymor outscored him in every category thereafter, thus earning a three-point victory over Iron Chef Zakarian. American wagyu beef is a delicacy — and straight-up delicious. As Alton explained from his perch, the meat is full of marbling, aka fat, which means that there’s a lot of flavor in each bite. Iron Chef Izard and the challenger, Chef Blamey, took full advantage of that this week with their offerings, showcasing the full richness of this exceptional product. 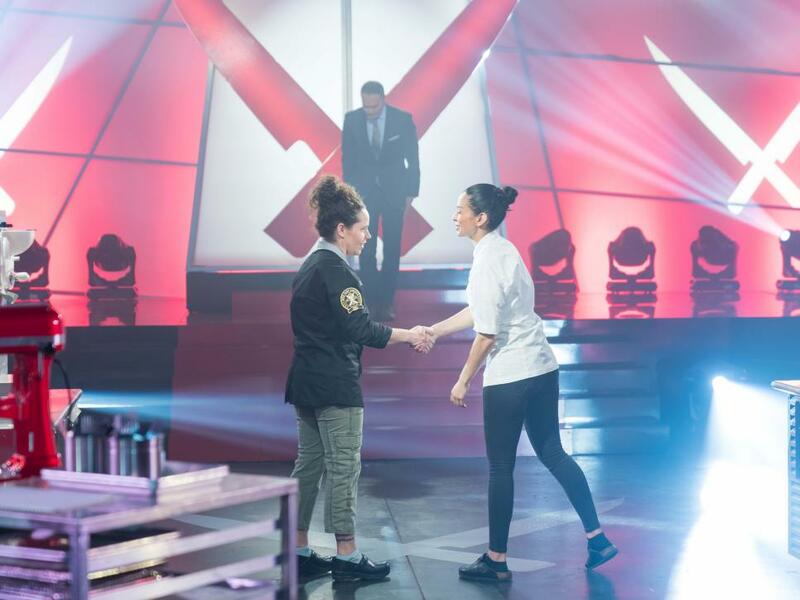 Both chefs opted to do beef presentations that were totally raw or mostly raw for their first dishes, but it was the Iron Chef who out-cooked her competitor by two points in that first match-up. Yep, you read that correctly … ice cream made with meat. 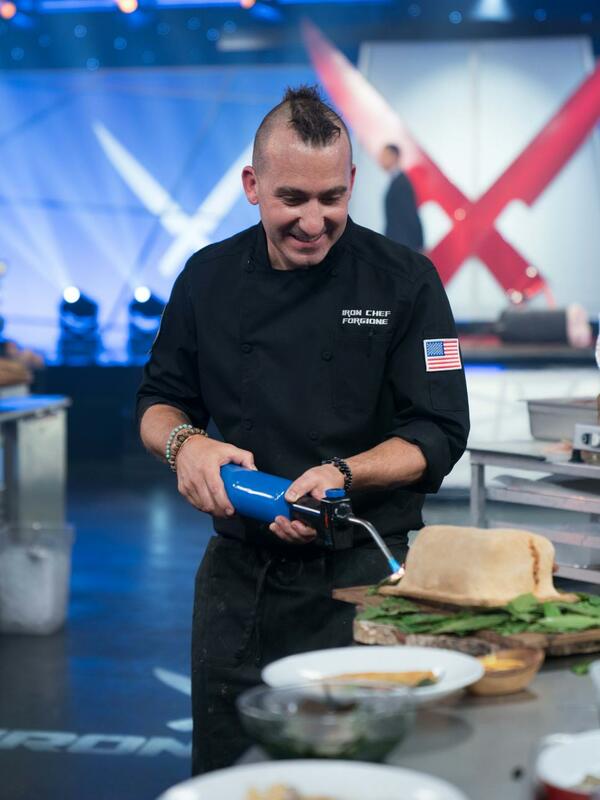 Of course, it was the brainchild of none other than Iron Chef Izard, who’s known for making over-the-top ice creams with savory ingredients. 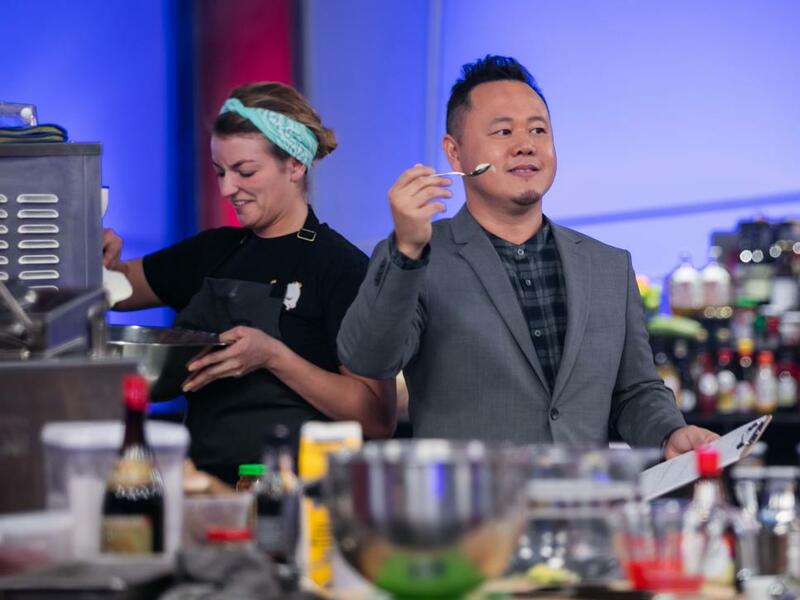 Floor reporter Jet Tila snagged a bite during the battle … and he was VERY into it. Given the high fat content in the wagyu beef and the fact that the Chairman mandated at least one grilled element in each course this week, Kitchen Stadium was nothing short of lit for all 60 minutes. No stranger to meat, burger aficionado Chef Blamey brought her A game tonight when she presented a stunning wagyu burger with cheese and a patty of bone marror. 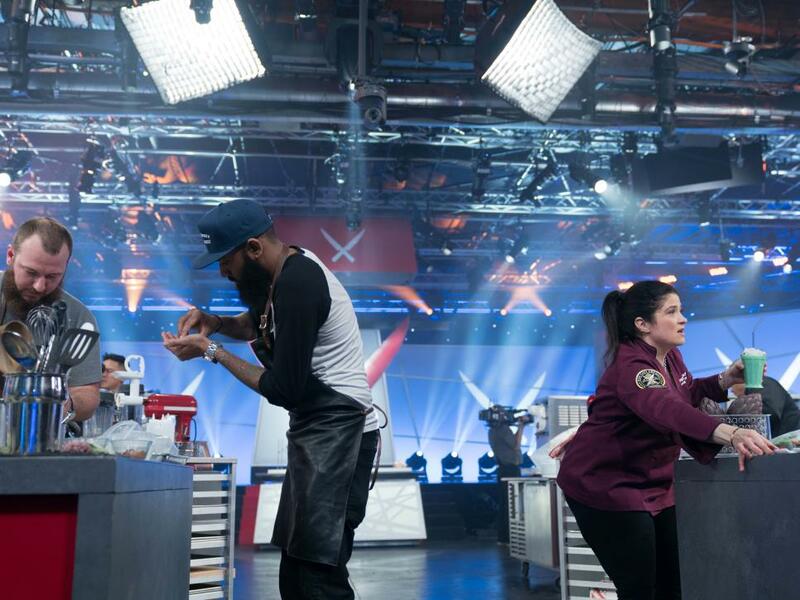 It was decidedly decadent, and much to her delight, the judges and the Chairman were beyond impressed with its flavor and the technique shown in creating it. 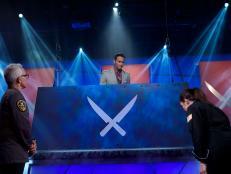 Though Chef Blamey’s offerings surely left a stellar impression on the judges, her menu couldn’t best Iron Chef Izard’s. Seven points separated the chefs, as Iron Chef Izard out-scored Chef Blamey in every category. 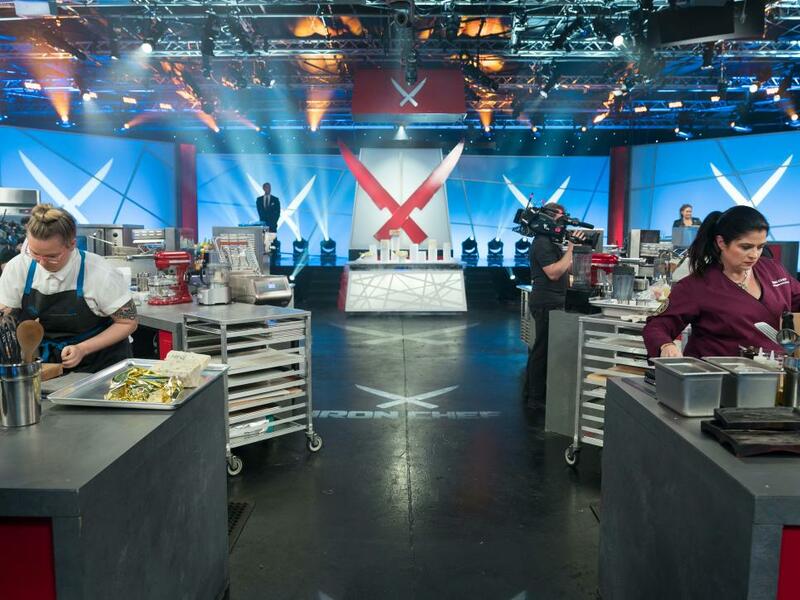 Host Alton Brown said it best when he declared, “A lot of really good blue cheese smells like gym sock.” The altar was full of nothing but the finest blue cheeses, which means that Kitchen Stadium got a little stinky this week— but it was all for the sake of culinary competition. 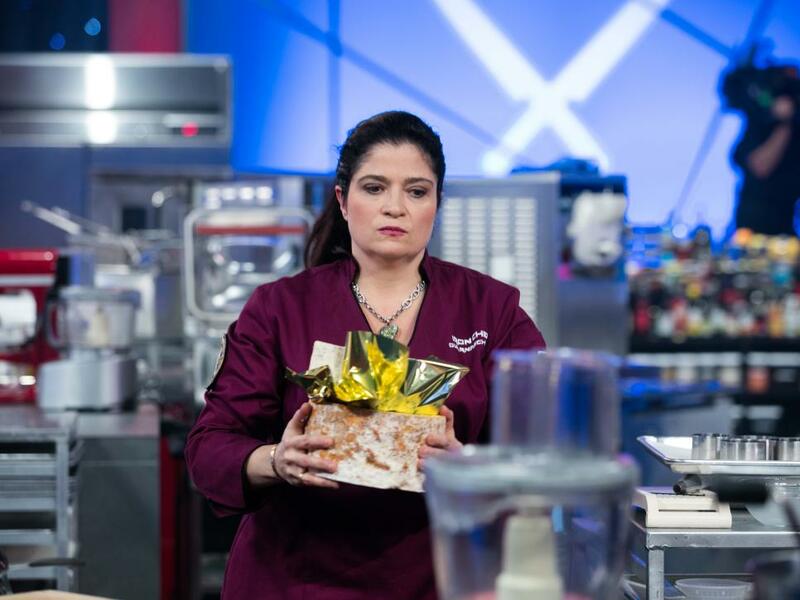 Iron Chef Guarnaschelli faced off against Chef Anderson, who’s known for her German-inspired fare. 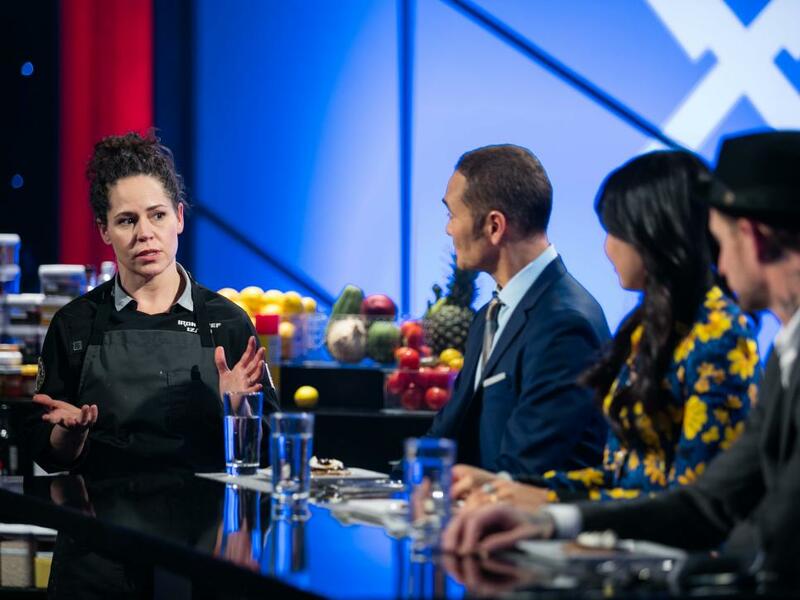 While the Iron Chef stayed within her wheelhouse of Italian-French-American cooking, the challenger strayed from her German perspective. She even made homemade pasta, just as the Iron Chef’s team did. This is Iron Chef Guarnaschelli’s first-course offering, bite-size cherry tomatoes stuffed with blue cheese and served with what else but a martini garnished with blue cheese-stuffed olives. 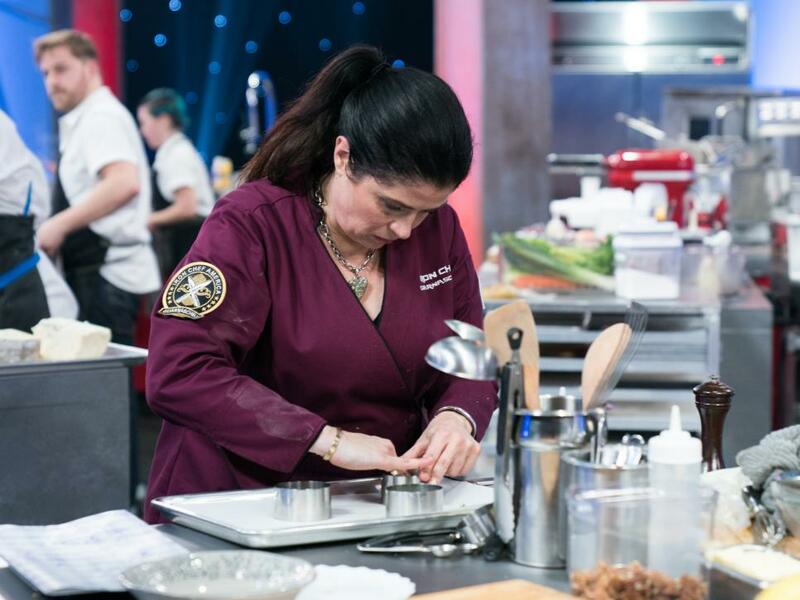 Though the judges thought the look of her plating wasn’t ideal, they couldn’t deny the taste of the dish, and they awarded her one more point than they did Chef Anderson. 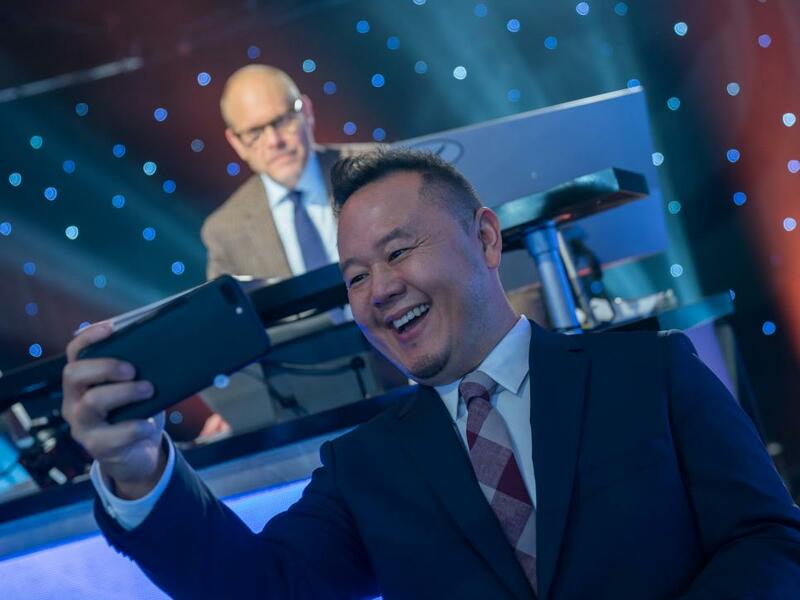 Though Jet Tila competed in Kitchen Stadium in the past, this marked his first battle as the floor reporter, which meant he checked in with both chefs, delivered updates to Alton and even snagged a few tastes of food. 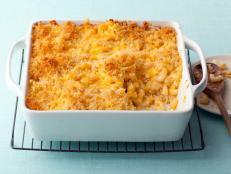 Both chefs were sure to use multiple kinds of cheeses in their five-course menus, a known tactic for impressing the judges, who like to see range in their competitors. 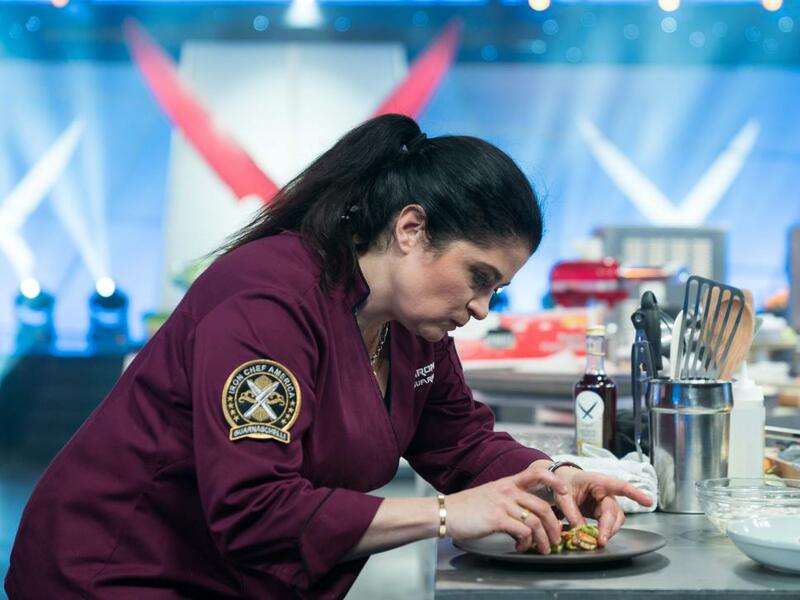 Iron Chef Guarnaschelli is known for bringing the heat to the competition, and sure enough, she wowed judges Antonia Lofaso and Simon Majumdar with her menu, either out-performing or tying her rival in each category to claim a four-point victory over Chef Anderson. 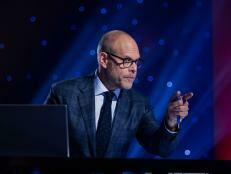 Host Alton Brown during Battle Lamb, as seen on Iron Chef America, Season 13. 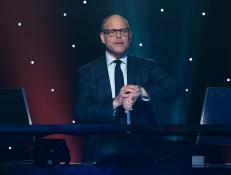 Behind the scenes with Host Alton Brown during Battle Clams, as seen on Iron Chef America, Season 13.